A page about the trials BSAs built by the Winwood family. I thought that we should include the "Walwin" to our site. And I don’t know why I have not done this before? Well the Winwood family were stalwarts of the Midland trials scene back in the Sixties. 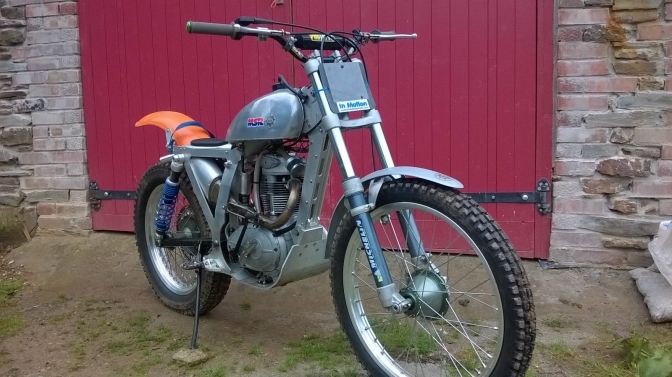 Not only building BSA engined trials bikes but also running and organizing trials too. Father Ray was the head of the family, but always had the boy’s mother Gwen helping him too, with preparation of the bikes at a trial, or observing on most occasions. She was also ACU Midland centre treasurer from 1974 to 1980 as well to keep the lady busy. The Boy’s Mike and Ross if I can remember correctly rode standard looking swan necked BSA C15 T’s for the start of their trials career. But then the image of the bikes started to change small modifications to engines and frame, started to appear. Eventually the lightweight duplex steel frames were used with influence from Reynolds Tube I feel, and probably with advice from Ken Sprayson. But I will have to ask Pat Slinn for confirmation. Ray was somehow involved with the aircraft industry, but my memory is hazy to what he did. Anyway, I remember Ray taking the first prototype Dural alloy frame parts from the boot of his car to show Ralph Venables, who I am sure would have had mixed feelings about the project. The revolutionary frames were however built, and surely could have gone a lot further with more industry backing, at the time. Just the old adage wrong place wrong time again. I found your website while I was looking up Ross Winwood. We met at Birmingham College of Art in the 60’s while studying Technical Illustration. We met up again when I went to work for BSA. We were both illustrating for the BSA catalogues while his brother was in the drawing office there. Their father I eventually met when he was in charge of the Girling (Tyseley) garage (they had some impressive cars in there – including a Ford GT40 - so no ordinary garage). I have no idea if any of that is of interest but it may fill a small gap in your pages. Charlie,> Thank you Trevor for that information that makes the history better. 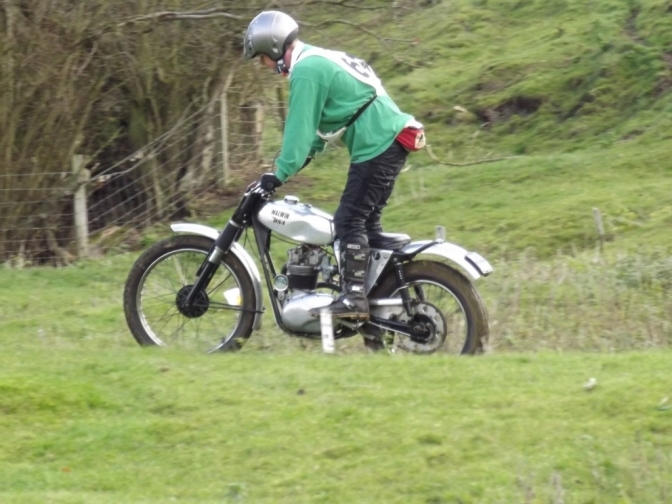 This is Eddie Freeman enjoying a Boxing-Day ride out on his steel framed Walwin. At the Leamington Victory Clubs Ufton trial. The steel framed bikes had an influence of Ken Sprayson about them and I am sure that Ken had a hand in the design of these frames. Taken from Off Road Review. Credit Deryk Wylde. And here is Eddie Freeman again on the same machine but earlier . In the Sam Cooper Union Jack Trial of 1997. How time fly's. 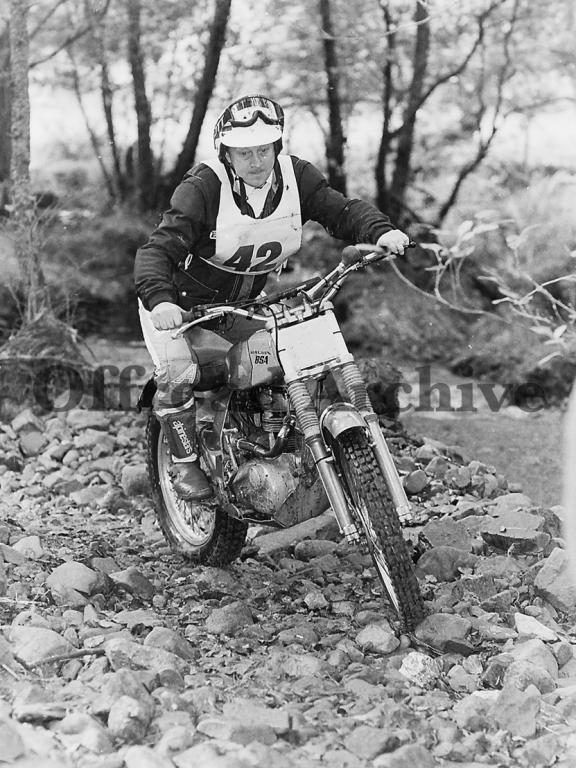 The Specials Class in the trial was won by Mick Mills BSA "Legend" 8 marks lost. 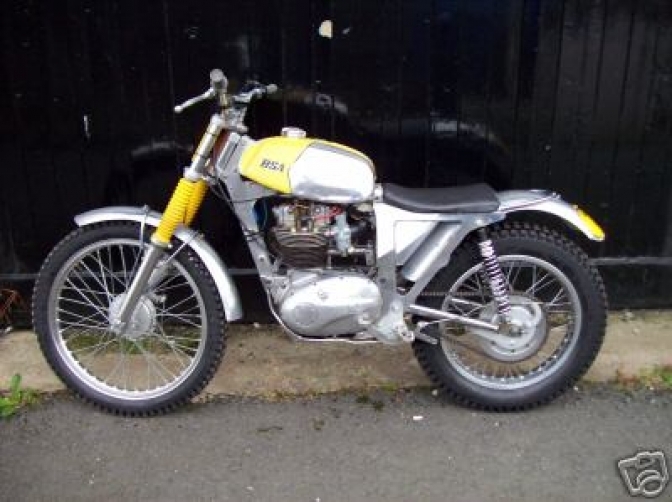 Second was Roy Trump BSA,16 marks lost. And Third Dave Paxton Triumph Twin.25 marks lost. John Perry's BSA outfit cried enough and Andy Hay jumped into Will's empty chair. 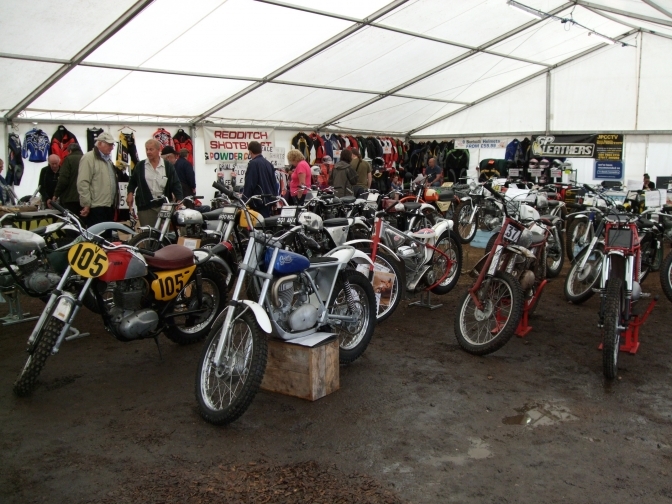 Here you can see the "Walwin BSA" next to the "Brian Martin BSA" that Andy Paxton rode in the 2012 Scottish two day trial, next to that is another Ex works BSA, and the owner of all three machines Ted Freeman,talking to another Oxfordshire BSA Trials Star and ex works rider renowned for being the only rider that could get a tune out of the B40 engined machine. Then the "Dural" aluminium Framed Machines. One thing that must be realized is that there was no laser or water jet cutting of aluminum then. So even if the sheets had been cut with a plasma jet cutter. The parts would have been finished by hand. Even pop rivets were newish for the time. right. and also a lot of annealing, between , every bend or fold. 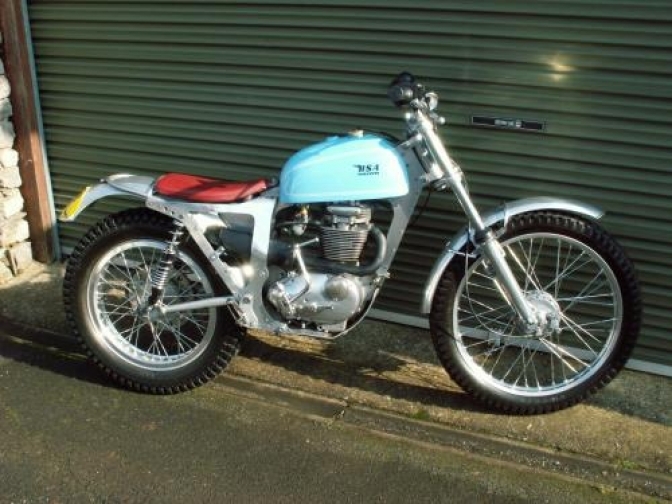 Not only was there an awful lot of work put into the development of the frame but as you can see,another BSA/Triumph item , the four-stud front forks, were converted to leading axle. to keep it British, where they could have just used Betor or Marzocchi. Even today the tooling to press these sections in one would be probably be to expensive to warrant the task. 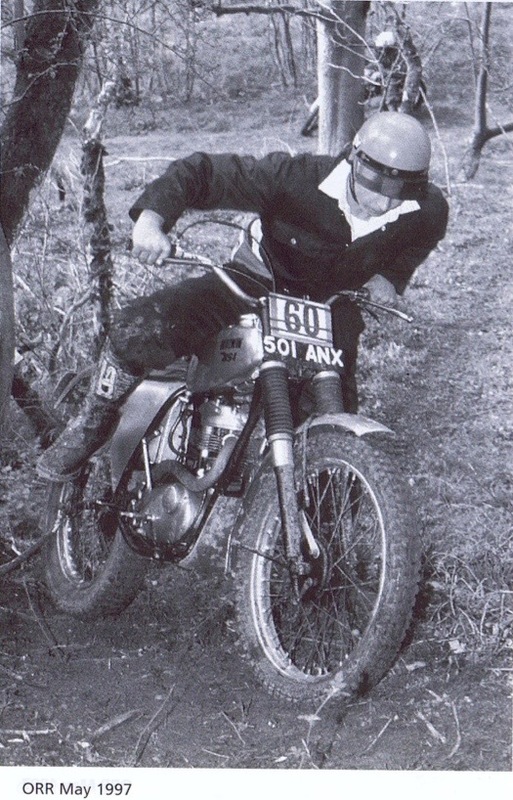 Mark Quinn today has sent me this brilliant shot of him riding the Walwin Bantam. He says he still rides it regulary in Northern trials. Nice one Mark. and thanks for the photos. Photo Courtesy and Copyright. "Trials Central" ,I hope you dont mind me using it Andy? 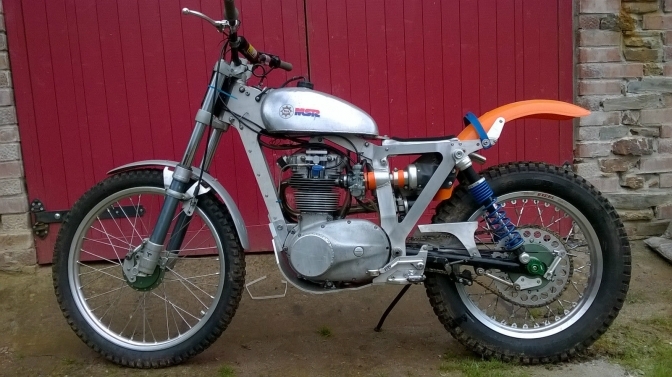 This is the Bantam engined version of the bike. Only picture I have. Heres a better picture of the Walwin Bantam for you. 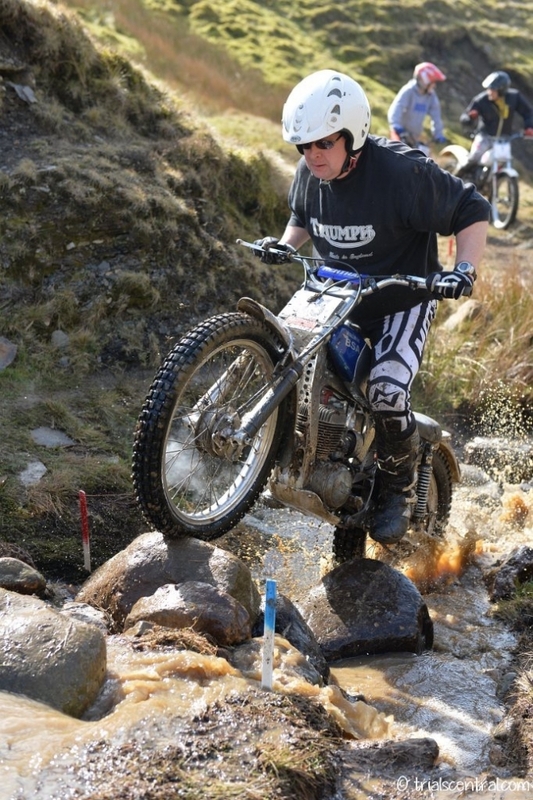 I have,Just found these images on my old computer, and with the e-Bay logo, means that they may have changed hands, but I did not keep any records at the time just saved pictures of trials machines that I cared about. 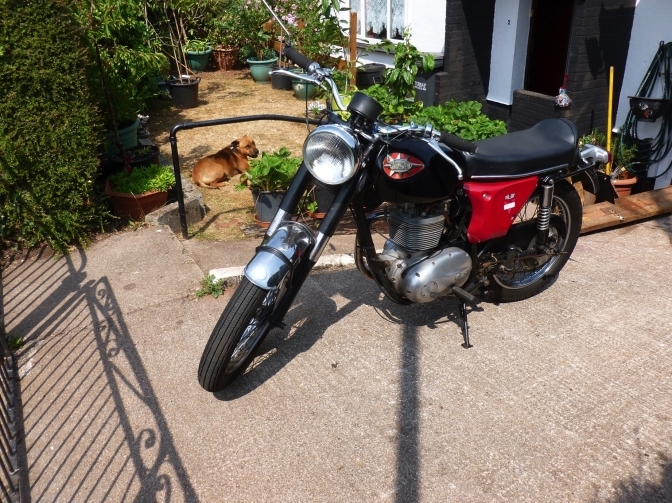 Although this picture is bad, it looks like this bike has had the motor swapped for a C or B "G" type engine in place of the B25 engine that I think were in the bikes when built. 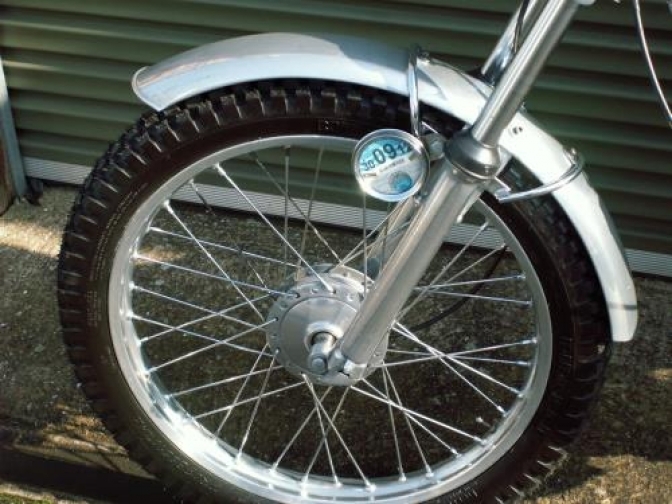 Also note that the front forks are the standard "Four Stud type without the added fork extensions to make them leading axle type, this would alter the wheel base of the machine and the fork trail too that the frame was designed for. Here is a shot of Keith Quinn,Deryk said I can use. He said it is a section he found for the Frank Jones trial, named "Cwmcwefru", and the next section was better? You dropped into a rocky river bed down a steep bank between two markers, took your own line anywhere down the river trying to miss some of the worse rocks, and then exit up the river bank on the other side, between two more markers. Nice Old Style section Deryk. I have distorted these to above photos slightly by making them to large but it helps to show the Build of the bike better. I will build on this page when I have done more research. Philip Chapman has been in touch with me this morning to sadly pass on the message that Martin Lampkin died at the week end. Philip's, daughter is married to Ross Winwood's son and they still live near Stratford upon Avon. Philip who lives in Silsden , says that Ross sold up the post office store he ran for years to build a house, he then sold that, and he and his wife have been touring "The World"? in there motor home. but are due home shortly. 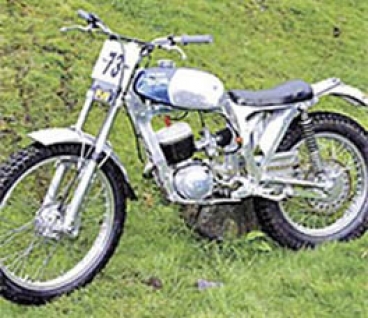 I hope I can then again contact Ross like I did a few years back on Trials Central, to get more of the story about the "Walwin" trials bikes. Philip also told me that Mike Winwood is rather poorly at this time. Keeping it in the family here is a photo of one of Philip's bikes. 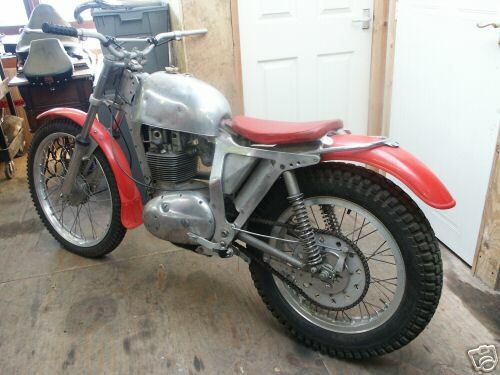 Well it would have to be a BSA would it not. a Very nice "Victor". Phil says he like me, has a job to kick start the bike at times though, so he has one with an electric start too, a Suzuki GT 550. 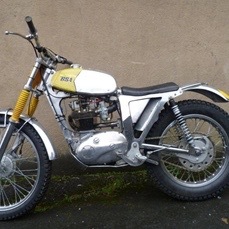 Now we have this other link to Ross we may get the full story about the "Walwin" trials bikes,and even the Grass trackers? 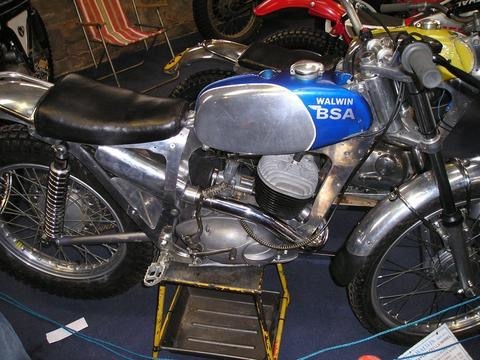 This is an ex Ross Winwood "Walwin" grass bike that was fitted with a 440 BSA engine originally but has been updated ? with this Jawa motor,the bike is up for sale I am told. I have just been looking at your Walwin site. 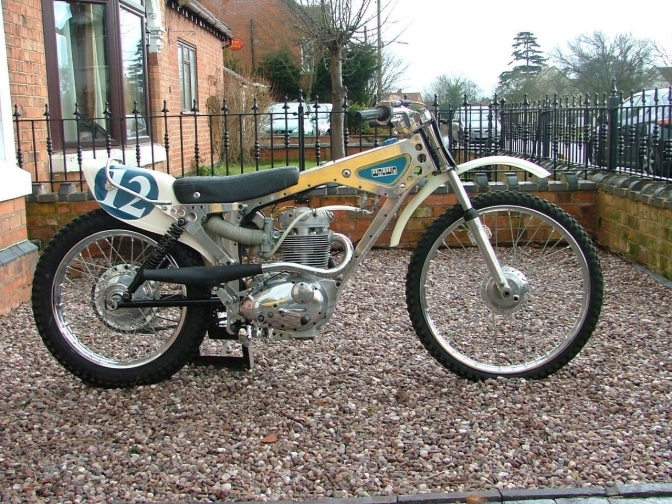 The bike shown is the final form Ross raced the bike after the B44 ceased to be competitive. I rebuilt it from a rolling chassis purchased at Auto Jumble. Had to sell through lack of space. 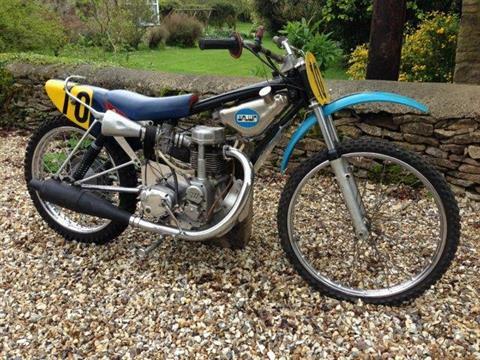 I have his Alloy Framed 350cc Which I have also rebuilt. If you would like more info please contact me. This shows of the Walwin construction method at its best. superb bike Bob. 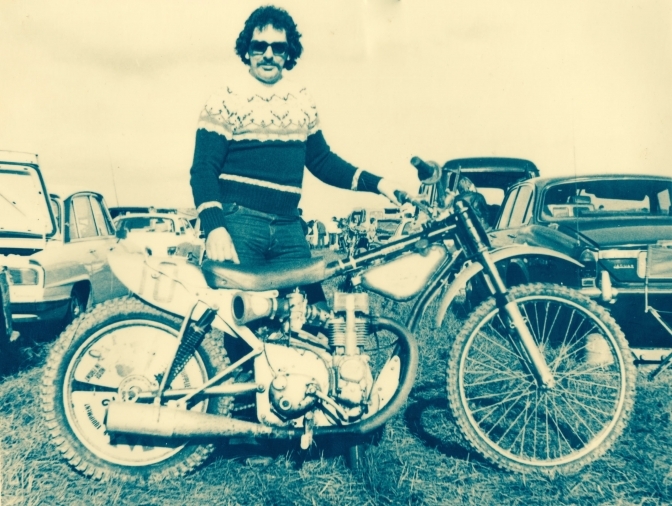 Here Is Ross Winwood with the final Jawa grass bike. Walwin Replica. built by Steven Pritchett. 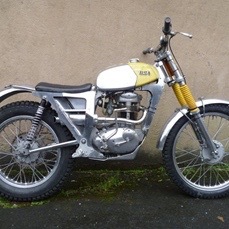 Skipping through e-Bay as you do a came across this machine for sale, well you know what they say about flattery. well this is a good example and I do mean Good. And here is what the owner builder has to say, Now I know that Mark Seward has something to do with this machine? Because of the rear shocks the machining and the Badge on the tank. Well the owner has now contacted me ,his name Steven Pritchett, and I have asked Steven if he would mind giving us the story of the bike. and he said he would give us any information on the build Good hey. Steven's description of the machine. This is my C15 walwin replica that I built as a bit of an engineer's play thing!! 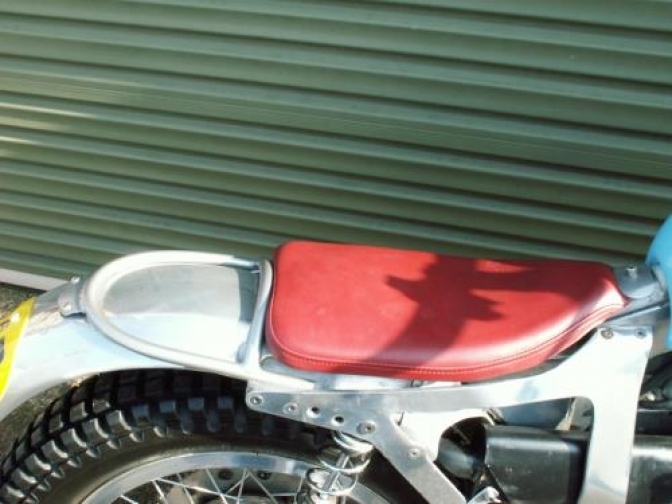 Whenever I saw pictures of the Walwin framed BSA's I knew I wanted one, and as a builder of custom bikes the seed for this project was born. The frame is entirely bolted together like a Walwin and consists of two lasered side plates CAD drawn to modern bike geometry (Beta Rev3). 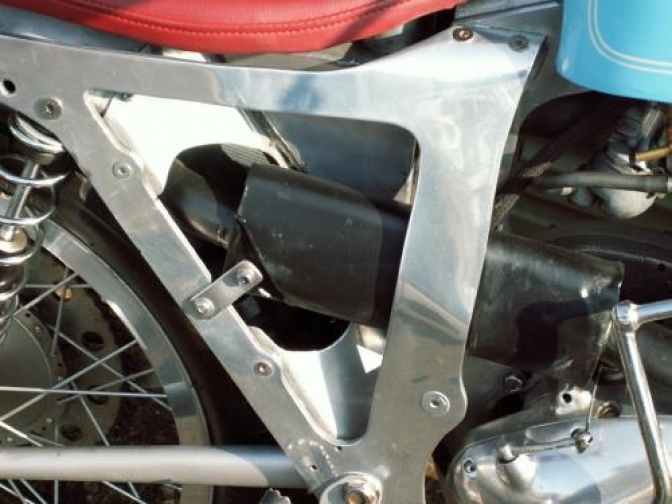 The head stock and separate parts of the oil tank which runs sandwiched up the spine plus the swing-arm pivot/ rear engine mount are from T6061 aircraft spec aluminium. Much work was done with the swing-arm to get it the right length and the geometry of the shock absorbers and the bike runs with good front to rear balance lifting the front easily whilst still finding grip on the slippery stuff. 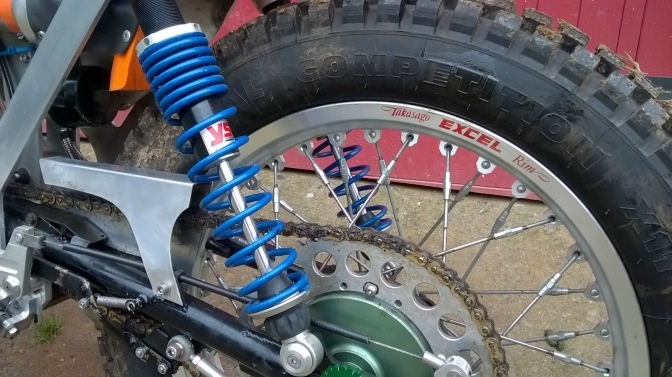 The shocks themselves are purpose built YSS with preload and damping adjustment and are quite brilliant. The forks are 38mm Paoli's (not elegible for pre65) in sherco yokes chosen as I was struggling to get a decent set of 35mm's at the time. The hubs are both made by myself, the rear is a Bantam replica and the front a conical type running TY shoes. The brake plates 'float' on their spacers allowing the shoes to self centre in the hubs. The engine has had much work with all metric bearings being installed. A new big end is fitted with readily available needle rollers. Timing side conversion has also been done along with end fed oil feed. The timing side bearing is a combined needle roller and ball race thrust bearing, in fact many of the bearings are over specified for the job. 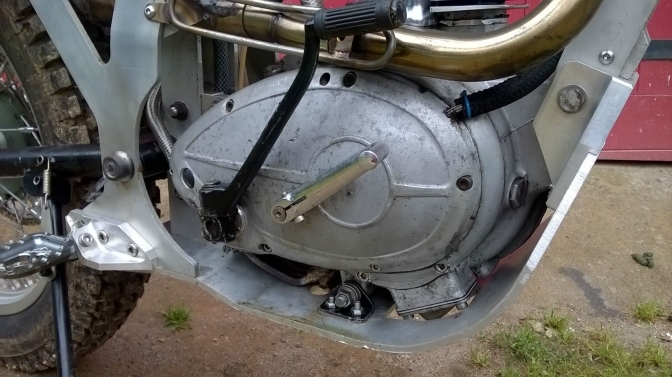 Its had new valves and guides and utilise's a triumph T100 piston. New gears have been installed for 1st gear to close the ratio's between 1st and 2nd. It also means that the bike has a new ratchet for the pawl so there's none of that kickstart slip! The oil feed to the head is a positive type system taken off the end of the crank and regulated by use of carburetor main jets to maintain pressure. She does leak a bit...... despite several attempts I still haven't got it 100% oil tight. A separate spin on filter is fitted. Please look at the pictures!! (they form part of the description) and please come and view to satisfy yourselves the bike as described. No guarantees are offered or implied. Test rides are possible. Woods and banks available! (Cornwall). Cash on collection only please!! Have just uploaded an additional picture of the primary drive showing the PVL ignition and also the one off aluminium clutch basket. This also feature a one off aluminium centre allowing full Yamaha clutch plate set to be used. 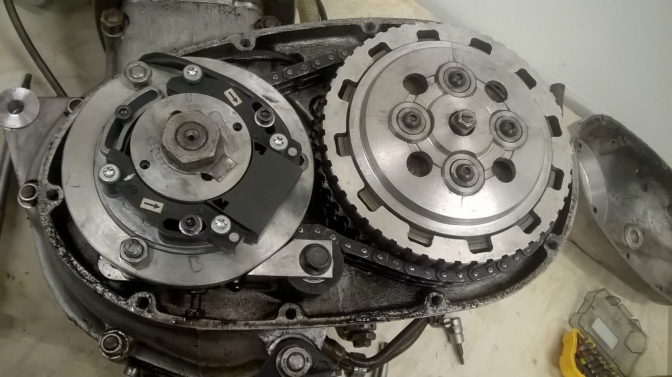 On the outside you can see where I initially used a belt primary drive but this was changed back to chain for reliability and performance. The bike is still curently for sale on e-Bay if you want to take a look. One last picture for now. I will get the full story on this machine Later.